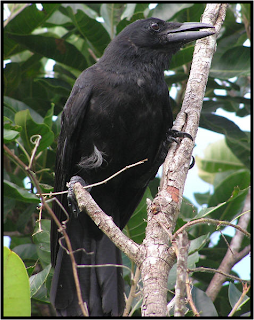 Facts: The Marianas Crow is a large Micronesian bird that stands around 15 inches tall when fully grown; however, it is smaller than the typical crow. This crow is mostly black with a slight greenish-black gloss on its head, back, and wings, and has a brown iris around the eye. The female Marianas Crow are typically smaller than the males. These crows prefer native limestone and secondary forests as a place for breeding, but will also live on beach strand vegetation and coconut groves as they forage. The Marianas Crow is omnivorous and is known to feed on insects, lizards, bird eggs, fruits, and seeds. According to a survey done by the U.S. Fish and Wildlife Service, an estimated number of 1,348 Marianas Crows were recorded on Rota in 1982, but has drastically dropped to 592 crows in 1995, making it a 56% decline. In 1999, an estimate of 110 breeding pairs was recorded, but recent estimates indicate only 60 breeding pairs. Threats to the Marianas Crow include habitat loss and degradation. They are very sensitive in areas where a lot of native forests has had mammals introduced or been altered by humans. 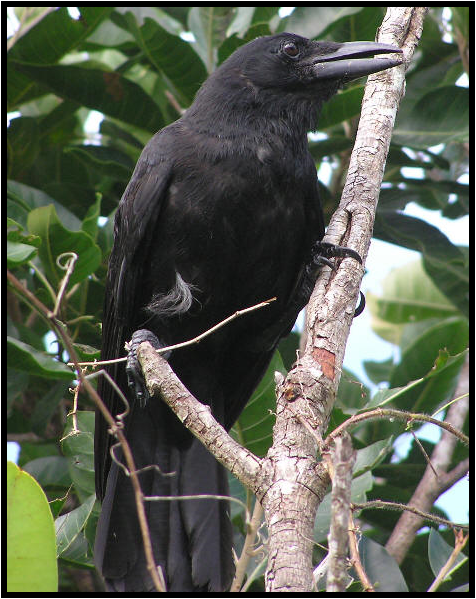 The CNMI is currently conducting a multi-year study of these crows which is held on Rota since 1996. “The study is focused on determining the factors that affect breeding success and the dynamics of juvenile dispersal.” (U.S. Fish and Wildlife). Predators such as rats, cats, and monitor lizards reduce crow nesting success, therefore resulting in reduction of population.